Relay Foods (www.relayfoods.com) will expand its corporate headquarters and Charlottesville fulfillment center to accommodate increased local demand for its products and to support the company’s entry into new markets, including those beyond Virginia. The company, a leading online grocery store and farmers market, will invest more than $735,000, create 25 new jobs in the City, and increase its Mid-Atlantic sales of Virginia-sourced meats, produce, dairy products, and value-added foods by $3 million over the next three years. The Commonwealth of Virginia is partnering with the City of Charlottesville and Relay Foods on this project through the Governor’s Agriculture and Forestry Industries Development Fund (AFID). 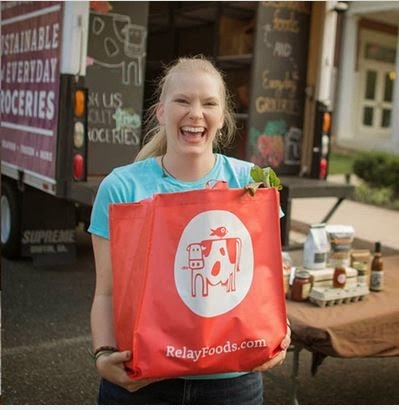 Relay Foods seamlessly integrates more than 200 local farmers and artisan, organic, and conventional producers to deliver high quality, local and gourmet foods and groceries directly to customers. The company offers a unique and powerful resource for small food producers in Virginia trying to access the market by providing ready access to consumers in the Washington D.C., Richmond and Charlottesville metro areas. This expansion will allow the company to further meet the growing demands of its consumers. The company, in partnership with Virginia and Charlottesville, will invest in updates to its Charlottesville corporate facility and fulfillment center, the main location for the aggregation, storage, packaging and distribution of all local Virginia meat, cheese and dairy products. These improvements will strengthen the company’s competitive position in the fast-growing online grocery market. Governor McAuliffe approved a $50,000 grant from the Agriculture and Forestry Industries Development Fund (AFID) to assist the City of Charlottesville with the project. Relay Foods is also committing to purchase at least $350,000 worth of meats, produce, dairy products and other foods from Virginia producers over the next three years. Through the Virginia Jobs Investment Program, Relay Foods will receive additional funding and services to support its training and retraining activities. According to a 2013 economic impact study conducted by the Weldon Cooper Center for Public Service at the University of Virginia, agriculture and forestry are two of Virginia’s largest industries with a combined economic impact of $70 billion annually. Agriculture generates more than $52 billion per annum, while forestry induces over $17 billion. The industries also provide more than 400,000 jobs in the Commonwealth.